John Brantley was a 12th round choice (#325) out of Georgia by the Houston Oilers in 1988. He’d be on the roster of the team through 1989 suiting up for 8 games playing on special teams. 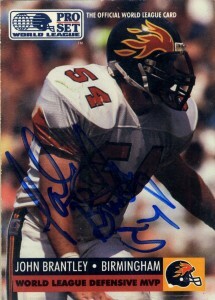 In 1991 Brantley was drafted by the Birmingham Fire of the WLAF in the 2nd round of the positional draft. A well rounded team leader, he’d finish statistically amongst the top players in the league with 47 tackles and 4 sacks. 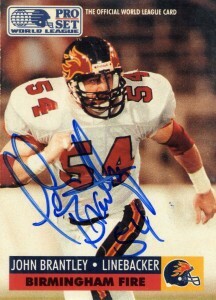 At the conclusion of the 1991 season John was be named first team All World Team, and would win defensive MVP in a three way tie with Danny Lockett and Anthony Parker. the Arena leagues or the CFL USA venture. He currently lives in Georgia.